Why is it the future of public relations? One century apart, Dr. Robert B. Cialdini (early 2000) the authority on influence and persuasion and Edward L. Bernays,(1900) the father of modern public relations, have completely captivated my admiration . So, what connect both, even though, a century apart? Both practiced, championed and advocated the use of science to be at the heart of persuasion and influence proven to create positive changes in industry and organizations. If the use of science has been prevalent almost a century ago, why is it the future of Public Relations? We need to go back to the past : to shape the future! Sounds like a script from a SC-Fi flick? but ……..that’s the reality! We have to go back to our roots to relieve public relations from one form or the other of media management—offline or online and come to be recognized as the practitioners of the science of persuasion, the professionals who are sought after, to build and protect reputations. Reputation is generally defined as “an opinion about somebody or something held by someone”, therefore, logically, the purpose of reputation management would be to either strengthen that opinion or change it, as the case may be and that involves influence and persuasion in an ethical way i.e. with consent and engagement. Persuasion is driven by science (understanding the underlying behaviours) at its roots and accomplished by persuasive communication (storytelling) delivered in a simple and engaging manner. So how do we apply science and creativity to develop successful reputation management campaigns that shape public opinion? 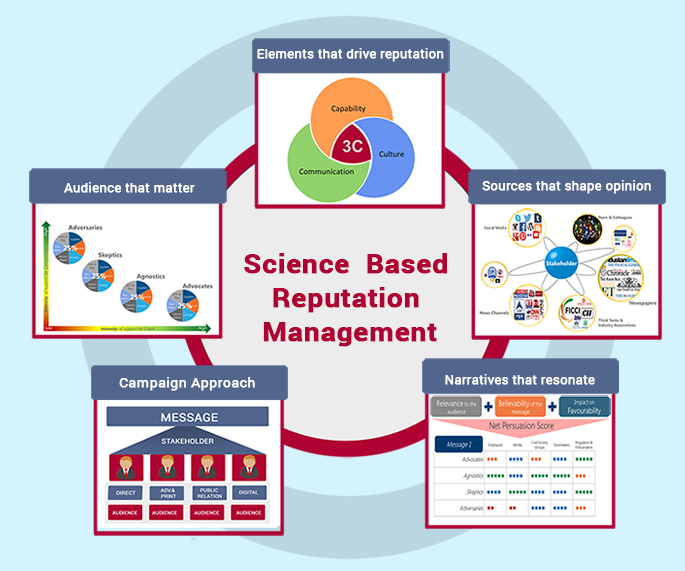 In my perception and belief, there are FIVE major steps that are involved in creating science based reputation management campaigns. These would sound simple and perhaps they are but they are certainly not new. So, why is it that large number practicing professionals, have over the years, ignored them and focussed increasingly on the aspects of storytelling at the cost of understanding the underlying factors that could make their stories compelling? The defined FIVE Steps major steps , form the heart of the Reputation Management campaigns developed The Astrum Way. Deliver your communication: be holistic yet focused. This is a vicious circle, as the 5th step leads to the 1st in understanding how the composition of the “Persuadables” has changed? Establishing evidence based impact measurement. This July, with the completion of two decades in Public Relations or which now should be rechristened Reputation Management, my exploration & fascination with the pursuit of science has never been more vigorous. On hindsight it appears, that a lion’s share of the successful work that my team and I did, was based on ideas driven by insights. Though, they may not have been as many as I would have liked, but their success encouraged and inspired me to keep the faith. Increasing number of CEOs more than often tell me that knowing “how to say” is the table stake, the premium is in knowing “What to DO and SAY? They seek programmes that impact business outcomes and not just analysis of media, traditional or social. A few years ago, we had an opportunity to present an advocacy strategy to a CEO of a major FMCG company facing public acceptance issues. The CEO interrupted in the midst of an impassioned presentation and posed a question. To quote “How do I know what you are telling me to do and spend money will succeed”? I was stumped. It set me thinking and the realisation dawned that, only when you are armed with insights to back your recommendations, can you really create a reputation strategy that is undoubtedly going to succeed. This approach formed the foundation of the work that was done as the Campaign Strategist for the BJP by us, in the general elections in 2014. The success of the work with BJP winning with an overwhelming majority only reinforced my belief that, ideas driven by insights is the future of persuasion. Last, but not the least, it would be pertinent to state that, today, we suffer from a severe attention deficit, an information overload that is making us selectively pull information most relevant to us and delete pushed content most times thus arises the need for ‘content/messaging’, that is not only relevant, but compelling enough to grab interest and eventually shape opinion. The most effective story telling today is the Real Stories of Real People told in a Real Way. In my concerted opinion, this can only happen , if and when we develop persuasive narratives gleamed from deep insights about our audiences. This is why I believe science based reputation management is the new definition of public relations and its future. It will help move, public relations campaigns from a shot in the dark based on ‘armchair’ and ‘desktop’ interpretations to be widely accepted based on rich insights and evidence. A judicious mix of science and creativity is therefore the logical next step in the path of evolution of public relations to reputation management. This is literally going back to our past to create our future. A lesson that was reinforced to me in my conversation with the CEO of the FMCG.